I recently had a need to establish a GRE tunnel between two sites. The reason being, we were deploying a Meru Wifi proof-of-concept where AP’s were on one site, and the controller on a remote site. Normally, the connectivity between AP’s the controller would go over the existing routed network (layer 3 mode in Meru-speak), but in this case, it wasn’t possible to get the new subnet assigned to the controller updated with the ISP providing the private links. As the customer was using Juniper EX switches and had a Juniper SRX firewall at the remote (controller) site, GRE allowed us to build the network without the need to involve the ISP. The JunOS 12.1 documentation above defines we allocate a port via it’s fpc and pic allocation. In my case, the switch was a single switch so the fpc was ‘0’. In a Virtual-Chassis environment, the fpc number would change. For example, if you wanted to use port 47 on switch 4, the command would be ‘set chassis fpc 4 pic 0 tunnel-port 47 tunnel-services’. With the port allocated, we can then build the GRE configuration. On the SRX-side, the configuration is as follows. Each GRE interface has a tunnel source and destination set (this is the routed interface of the device at each end) and an inet address assigned to the interface which is used to establish the tunnel (10.11.12.1 and 10.11.12.2 in my case). I’ve used unit ‘1’ on my SRX, as I already have some GRE tunnels built to other destinations. A GRE interface uses the same unit assignment as a switch or inet port in JunOS, they can be used for different connection purposes. GRE tunnels show ‘UP’ immediately, even if the configuration isn’t set correctly, so don’t assume as it’s UP, it’s going to work. Look closely at the Input/Output packet count to validate traffic flow. Here’s the output of ‘show interfaces gr-0/0/14.0’ on the EX. Now the output of ‘show interfaces gr-0/0/0.1’ on the SRX. Back on the EX switch, we set routing-options to send any 10.0.0.0/24 traffic through the GRE tunnel. 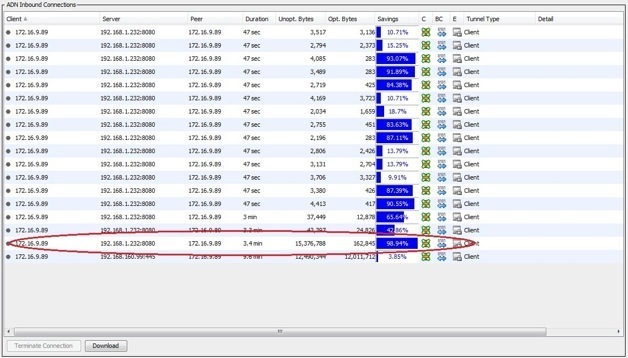 On the SRX, we set the routing-options to send any 10.50.50.0/24 traffic in the same manner. As the SRX is a firewall, we need to perform some additional steps to allow traffic. This means creating a ‘zone’ to assign the GRE tunnel interface too, disabling any Network Address Translation rules, and some security policies to permit the traffic. Here’s what I’ve configured. Now we should be able to initiate a traceroute from the EX switch to our Meru Controller (10.0.0.3). Looks good. We enter the GRE tunnel interface (10.11.12.2) and exit directly to the Meru Controller. Since setting up ‘Transparent Redirect with JunOS‘ some time ago I’ve been pleased with the way things have worked out. With a Blue Coat ProxySG appliance attached to my SRX210, intercepting is highly effective and when mixed with the excellent filtering capabilities of the ProxySG and Blue Coat’s ‘Web Pulse’ online rating system and their Web Filter database you get a very good level of protection from malware and malicious content. Having gone through the Juniper Security course a while back, I’d spoken to the course instructor at the time about implementing load-balancing across multiple filtering devices to add capacity to the solution and perhaps enhance the speed with which content is retrieved. The course instructor had kindly given me a few tips on how to implement it, and so with some time to spare, I decided to try the setup. As I only have one ProxySG to use, I decided to setup two Squid-Cache VM’s to test how to implement the solution. Admittedly, Squid-Cache doesn’t have the same level of filtering capabilities as the ProxySG, so instead, I mixed the load-balancing implementation with Blue Coat’s ThreatPulse cloud service. As a Blue Coat Blue Knight, I’m fortunate to have access to the TP Cloud service offered by Blue Coat, and one of the methods for accessing the service is using Proxy Forwarding (e.g it would work with ISA, Squid, ProxySG, etc or any other proxy solution which can forward to upstream servers). I won’t go into the ThreatPulse service setup here, however (maybe another time). All devices are in the Trust zone for my purposes, but there’s nothing to stop you putting them in separate zones if you wish. First off, as with the single transparent intercept solution I’ve written about before, we setup a routing instance to deal with what to do with the traffic once the firewall filter has intercepted it. Both static route destinations have a ‘qualified-next-hop’ with preference of 5. Here that is in display set form. 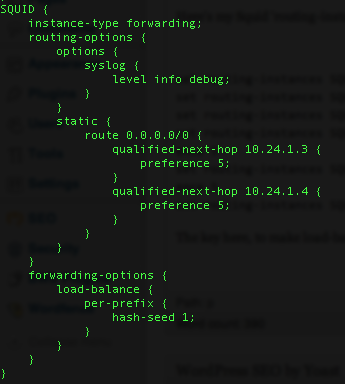 The key here, to make load-balancing work, it seems is to set the forwarding-options addition to the routing-instance. The per-prefix hash-seed value is what makes the Packet Forwarding Engine perform the load-balancing. Next, the filter, which is similar to the previous filter setup for redirecting to a single host (it’s the routing-instance configuration which makes the difference). You’ll notice my filter is called ‘proxysg-fbf’, this is because I’ve added the new filter term to redirect to the SQUID routing-instance into my existing filter-based forwarding configuration. 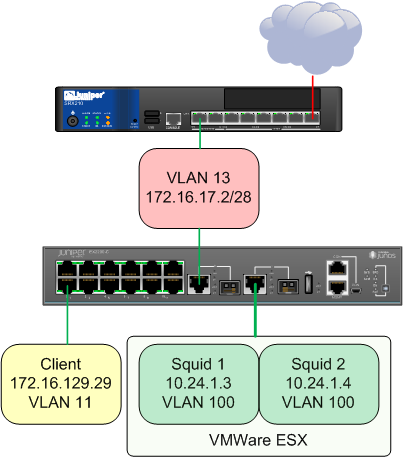 I simply want to redirect two particular hosts to the SQUID instance for testing purposes, everything else would still go to the PROXYSG routing-instance. As with my previous example article, I’ve added a ‘count’ to the filter term to show me that traffic is matching. Term t3 – redirects to the ProxySG routing-instance. Term default – accepts everything else. We need this, otherwise all other traffic would be dropped. Here, I’m assigning the filter to an ingress/egress vlan on my SRX, but you could just as easily assign it to the ingress interface of VLAN 11 per my topology above. Notice that both Squid-Cache processes are forwarding to proxy.threatpulse.com as per the cache_peer directive. You can also observe traffic matching the filter on the SRX itself. Note the ‘redirected-squid’ counter. So, after all this is done, how do I know I’m talking to a proxy, not the destination website from the clients perspective? As you can see, we can detect whether a proxy is involved by using a lookup against request header values, like X-Forwarded-For. The IP also isn’t my home IP which I’d expect if I weren’t being sent to ThreatPulse. So there it is. Load-balanced Transparent Redirection using JunOS, Squid, and the extra benefit of Blue Coat’s ThreatPulse Cloud service. I have to say, I love proxy servers. Transparent proxy is my preference. Of all the Proxy servers in the world, the best in my opinion is Blue Coat’s ProxySG appliance. With the Blue Coat ProxySG as your proxy in transparent mode, this allows us to inspect content, without the need for user input, and to direct the traffic to a proxy so you get all the benefits of Web Pulse, Web Filter, ProxyAV, Wan Optimisation and Flash Caching. Plus the use of CPL (Content Policy Language) to decide whether users should be allowed access to a site or not. With transparent proxy that responsibility is dealt with by the network, and quite right too. There are some applications which don’t, however, respond well to transparent proxy, especially those which don’t understand authentication (are you reading this Google, Apple and Adobe!!!) so they have to be handled on the ProxySG with some custom CPL, however these little issues shouldn’t’ stop you considering transparent proxy as an option if you are planning a Blue Coat deployment or any other proxy which supports transparent redirect. First off, we setup a firewall filter to assign to an interface. 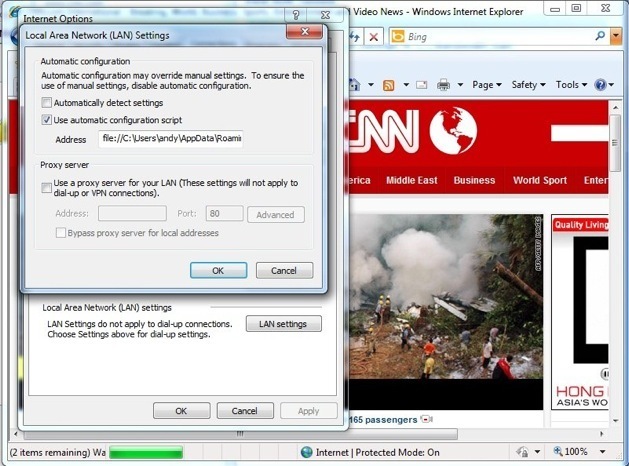 The interface can be either family inet interface, or a virtual (VLAN) interface. This filter redirects anything from source subnet 10.11.40.0/24 (the client subnet) destined for anywhere on port 80, 443 or 21 to the proxy on routing-instance ‘PROXYSG’. Next, we need to have some way of redirecting the traffic ‘off-path’ to the proxy server. This is handled by a routing-instance, in this case to proxy server 10.11.30.2. Next, in order to combine the two routing-instances, we create a rib-group entry. Finally, the filter we created earlier is assigned to an interface, in this case, the ingress interface which client traffic appears from. In order to have some failover capabilities, were the proxy to fail, we can use event monitoring probes on the EX switch to force a configuration change on the forwarding filter in the event the proxy fails. This is done using a custom monitoring script which was originally designed for use with Juniper WXC appliances. The script should be uploaded to the EX switch using FTP or SCP and placed into /config/db/scripts/event/ (or whichever is relevant to the JunOS version you are running – tested on 11.4R2.14). Once loaded, you can create the RPM probe and event policy actions. The event probe is setup as follows under the ‘services’ stanza within the configuration. This will log either ‘PING_TEST_COMPLETED’ or ‘PING_TEST_FAILED’ in the ‘messages’ log on the switch. Next, we create the event-options section to tell the switch what to do in the event of it seeing the ‘PING_TEST_COMPLETED’ or ‘PING_TEST_FAILED’ in the messages system log. The following two configuration options show what the EX switch will do in the event of each. * In the event of a failure, disable the firewall filter. * When the failure is fixed, re-enable the filter. set event-options policy rpm_down attributes-match PING_TEST_FAILED.test-owner matches "^proxysg$"
set event-options policy rpm_down attributes-match PING_TEST_FAILED.test-name matches "^proxy-ping$"
set event-options policy rpm_up attributes-match PING_TEST_COMPLETED.test-owner matches "^proxysg$"
set event-options policy rpm_up attributes-match PING_TEST_COMPLETED.test-name matches "^proxy-ping$"
Every 20 seconds, it will re-check the message log, looking for the fail or success. If it sees a PING_TEST_COMPLETED, it will re-enable the filter. You can view the filter counters to see traffic being redirected as we added a counter to the firewall filter term. You can add failover to a second proxy by adding a second routing-instance and firewall filter term quite easily in order to ensure that traffic is always proxied (thus, your corporate AUP is always enforced). The RIB group is amended to add the second PROXYSG2 routing-instance. Once this is done, the EX switch will continue to monitor the PROXYSG ip (10.11.30.2) and set it as inactive should it fail. If it does, the second term of the firewall filter (term t2) will become active. You can, of course, setup a second event-option monitor to monitor the second PROXYSG2 proxy (10.11.30.3) so that it also is set as inactive were the proxy to fail. So there it is, transparent redirect in a WCCP-like manner using JunOS. The implementation above has worked on both a test EX switch and an SRX. I’m still working on whether we can emulate the load-balancing functions available from WCCP, via JunOS but for now the above configuration would certainly give you failover if you were to have two proxies. set system root-authentication encrypted-password "REMOVED"
set event-options policy rpm1_down attributes-match PING_TEST_FAILED.test-owner matches "^proxysg1$"
set event-options policy rpm1_down attributes-match PING_TEST_FAILED.test-name matches "^proxy1-ping$"
set event-options policy rpm1_up attributes-match PING_TEST_COMPLETED.test-owner matches "^proxysg1$"
set event-options policy rpm1_up attributes-match PING_TEST_COMPLETED.test-name matches "^proxy1-ping$"
I posted this (via some contacts at Blue Coat) in it’s original form to the Blue Knights wiki. I thought the general population of Blue Coat users would find it useful too. The requirement was to provide automatically directed explicit internet access with no local break-out for Juniper SA clients. When users were disconnected from the corporate network, the requirement was to have BCWF categories blocked by default thus maintaining protection and control of access even when away from the network. The most useful of those categories when users aren’t connected to the network are the Web Pulse categories – Spyware/Malware, Spyware/Malware Sources, Phishing and Suspicious. These categories and the Web Pulse dynamic ratings service are worth their salt and a good reason to install the client on corporate mobile devices. 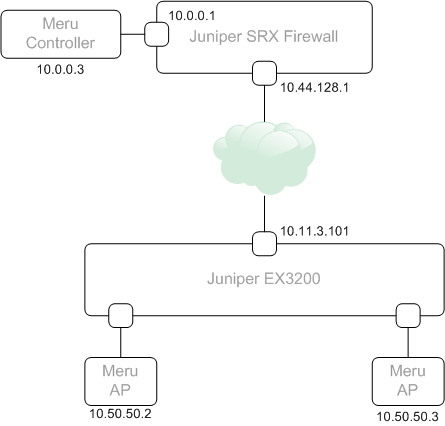 In order to provide directed ‘explicit’ proxy access to the customers network when Juniper SA clients dial in, a PAC file can be distributed from the SA with the following type of configuration. 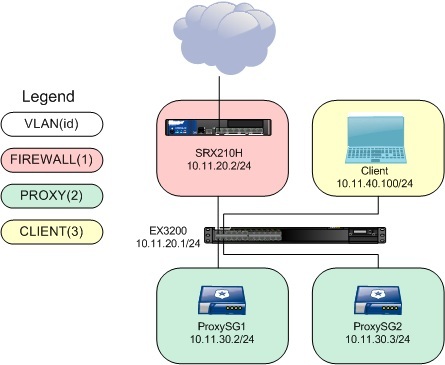 The customers environment already had two ProxySG’s, these were explicit proxies for the internal network. We added the ADN Client Concentrator functionality. An SA2500 acted as the ‘dial in’ service for clients. A VIP (Virtual IP Address) was assigned to the ADN/Client Manager. The VIP is required because as we discovered, using the appliance’s normal explicit IP traffic wasn’t accelerated. The reason for this is that the ADN traffic needs to traverse the ADN tunnel and arrive at a device on the other side in order for the ProxySG/Client to accelerate. The VIP provides that function without the customer having to purchase a separate unit for Client Concentrator and Explicit proxy purposes. With this information, we configure the PAC file on a host behind the SA2500. In it, we define that 127.0.0.0/8 should not be redirected, but all other traffic IS directed to ‘PROXY <proxy>:8080’. We bypass 127.0.0.0/8 because this would otherwise block the ProxyClient from functioning. Further tightening up could occur to avoid ‘Proxy Avoidance’ software from bypassing filtering. Once this is done, we can configure our Network Connect connection profile. Then with the PAC file location. For the test, I setup a new role mapping so that my proxy settings matched the PAC requirements. With this done, we can open up the Network Connect client and connect to the network. Third-party applications are blocked because no automated internet settings were provided. 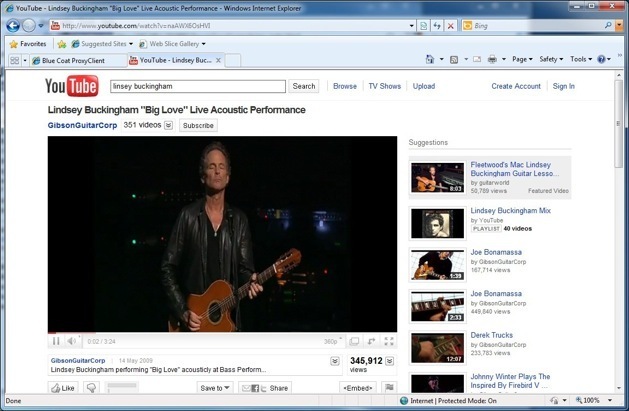 Whereas IE is able to browse because it’s been configured to use the PAC file. Using the VIP as our explicit proxy allows the Proxy Client to intercept and accelerate content which ordinarily can’t be cached. For example, if you were to watch your favourite You Tube video, clear the cache and reboot then connect to the SA again to watch the same video, the video should be byte-cached as in the example below. So, with the capabilities of the ProxyClient from an acceleration perspective proven, how about that requirement for control of users internet access based on categories, even when they aren’t connected to the network? Well, this is handled from the CM (Client Manager) console. Here you can define the BCWF categories (along with Local Database one’s if you use a Local DB or even other 3rd-party databases like the Internet Watch Foundation) so that they are allowed or blocked. Safe-Search can be enforced here also, along with filtering of HTTPS connections. 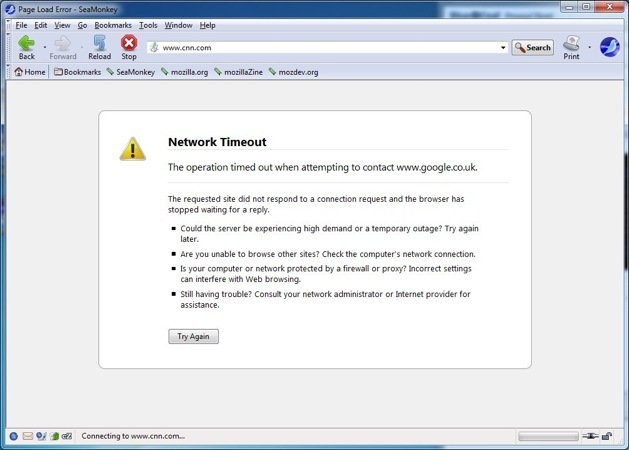 The effect is, when a user isn’t connected to your corporate network, and they attempt to view a site falling within a blocked category they’re denied access. The Block Page can be customised to make the URL more in-tune with your corporate identity. The ProxyClient uses the same Web Pulse cloud service as Blue Coat’s K9 Web Protection client. URL requests are submitted to Web Pulse to validate the category. Unclassified URL’s are scanned and rated on-the-fly, returning a categorisation to the client in order to make a filtering decision. This method for corporate access provides the following benefits. Reporting per-user if you have Blue Coat Reporter in use. Protection from malicious content via centrally published and controlled BCWF categories such as Phishing, Suspicious, Spyware\Malware Sources, and Spyware Effects when both inside AND outside the corporate extranet. Caching of non-cacheable content in Byte-Cache for remote workers. This includes YouTube (as above) and other streaming service such as BBC iPlayer. Under normal circumstances, this traffic cannot be cached (Pragma: no-cache is returned) or can only be cached for a short period. Using the ProxySG’s Byte-Cache we can store this content. The same deployment type could be used when installing appliances. If the customer requires a centrally managed explicit proxy but wants ADN acceleration also (on the same box) for remote users we can use the ProxySG Manager/Concentrator with a VIP configured so traffic can ‘exit’ the tunnel at the core and be accelerated. Non-cacheable content would be stored in byte-cache. The ProxyClient provides some great functionality in the form of WAN Optimisation but when it’s coupled with the Web Pulse cloud service for dynamic rating of URL’s it adds amazing protection to a roaming corporate device that no other WAN Optimisation vendors client can. And best of all, it’s free! 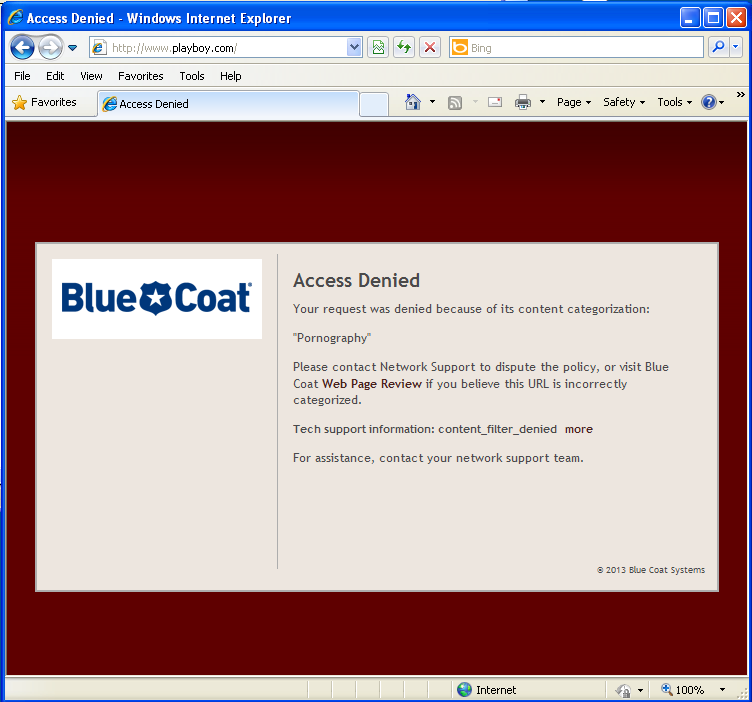 The only requirement being that you have a Blue Coat appliance and a Web filter license option.